“November is coming!” chanted one group of protesters outside the room where the Judiciary Committee met Friday. WASHINGTON — Inside a Senate elevator, a pair of women confronted a key GOP senator who had just revealed his decision to support Supreme Court nominee Brett Kavanaugh. 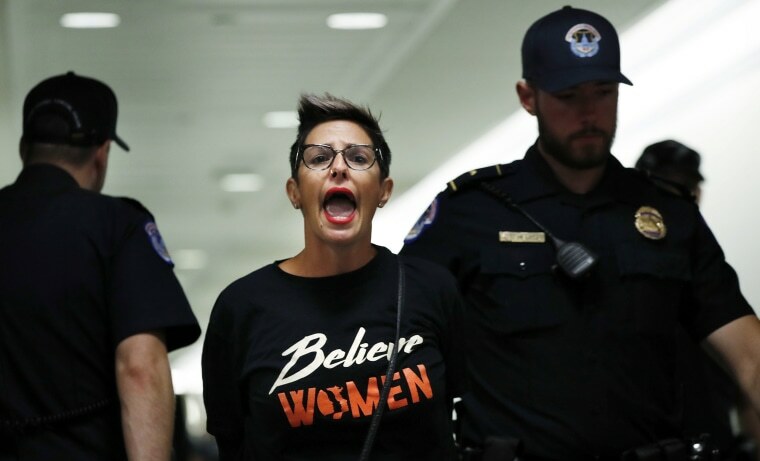 Dozens of protesters inside the Capitol chanted “November is coming.” And Democrats walked out of a hearing room in protest as Republicans pressed forward on scheduling a vote to advance Kavanaugh’s nomination. A day after the high-stakes hearing in which Christine Blasey Ford publicly testified about Kavanaugh allegedly sexually assaulting her when they were in high school, dissatisfied Democrats and angry voters alike expressed their unhappiness ahead of the Senate Judiciary Committee's afternoon vote on the nomination. Moments before the Senate Judiciary Committee meeting began Friday morning, Sen. Jeff Flake, R-Ariz., who had been considered a potential key swing vote on the panel, released a statement saying that he planned to vote in favor of Kavanaugh’s nomination — a move that all but guaranteed that he would be reported favorably out of committee, paving the way for a final Senate vote within days. Minutes later, as Flake then headed to the hearing room where the committee was scheduled to meet, two women yelled at the senator loudly for several minutes as he stood quietly in an elevator. “You have children in your family. Think about them! I have two children. I cannot imagine that for the next 50 years they will have to have someone in the Supreme Court who has been accused of violating a young girl. What are you doing sir?” one of the woman shouted. Inside the hearing room, after Republicans voted down a motion by Sen. Richard Blumenthal, D-Conn., to subpoena Mark Judge — Kavanaugh’s friend who Ford says was allegedly a witness to her assault 36 years ago — the committee's vote to formally weigh in on the nomination Friday afternoon drew sharp reactions from visibly upset Democrats. When Sens. Cory Booker, D-N.J., and Kamala Harris, D-Calif., were called on to vote, they sat in silence. “They're not answering because this is so unfair,” said Sen. Amy Klobuchar, D-Minn., as the motion succeeded. In the hallway outside the Dirksen Senate Office Building hearing room, protesters sat and arranged themselves on the floor. “November is coming!” they chanted, as Capitol Police stood nearby with plastic handcuffs, ready to arrest them. Other protests could be heard taking place on the floors below. Harris, Blumenthal and Sen. Mazie Hirono, D-Hawaii, then walked out of the committee room in protest. “The real facts, the real story here has not been told. And make no mistake, the truth will come out about Brett Kavanaugh. It’s only a matter of time,” said Blumenthal, standing with the other two senators and flanked by more than a dozen House Democrats, some of whom had stood in the back of the committee room during the proceedings, watching. “This is a failure of this body to do what it has always said it is about which is be deliberative,” said Harris, widely considered a potential 2020 Democratic presidential contender. On the steps of the Supreme Court, a mass of several hundred protesters gathered for a noon demonstration. Over in the Hart Senate Office Building that connects to Dirksen, several dozen more protesters gathered, including survivors of sexual assault and misconduct. Cher Finnan, 51, said she traveled to D.C. to protest from Chester County, Pennsylvania, with her daughters. Harris spoke, telling protesters that Kavanaugh’s demeanor on Thursday called into question his credibility and demonstrated that he was a bully. The crowd chanted “Unfit!” in response. As protests continued Friday afternoon, Flake added late conditions to his committee support for Kavanaugh, saying he would vote to send the nomination to the full Senate if the floor vote was delayed for "up to, but not more than, one week, in order to let the FBI to do an investigation limited in time and scope to the current allegations that are there." The Senate Judiciary Committee then voted to report Kavanaugh’s nomination favorably to the full chamber, the next step in the confirmation process. Frank Thorp V, Leigh Ann Caldwell, Alex Moe and Lauren Egan contributed.